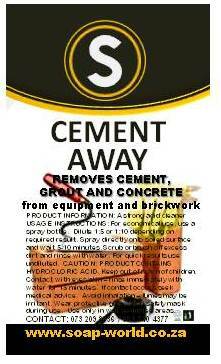 Soapworld Cement Away is a acid based cleaner that removes cement, grout and concrete from equipment and brick work. USAGE INSTRUCTIONS: For economical use, use in a spray bottle. Dilute Soapworld Cement Away 1:5 or 1:10 with water depending on the required result. Spray directly onto soiled surface and wait 5 - 10 min. Scrub or brush off excess dirt and rinse with water. For quick results use undiluted.